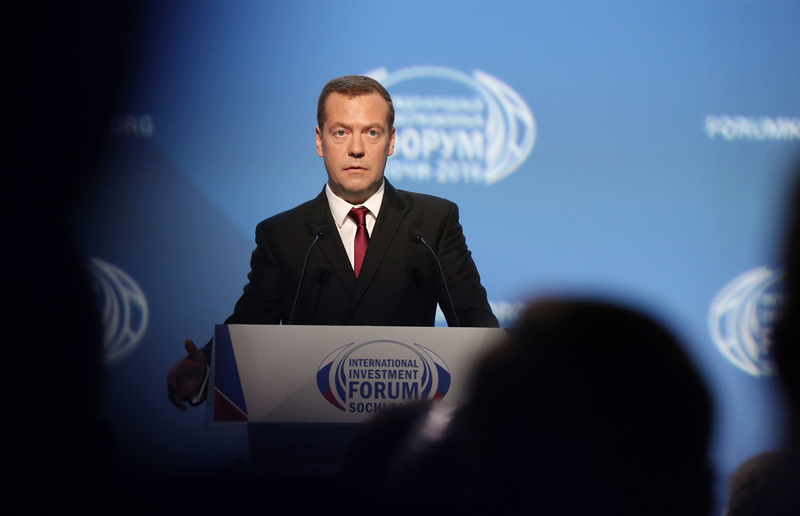 Russia's Prime Minister Dmitry Medvedev addresses a plenary session titled "A New Standard in Public Administration: Projects for Growth, Projects for Life" as part of the 2016 Sochi International Investment Forum at the Main Media Center in the Olympic Park, Sept. 30, 2016. Russian Prime Minister Dmitry Medvedev, while speaking at an economic forum in Sochi, said the government would set 11 key targets to develop Russia’s economy and improve life in the country. Prime Minister Dmitry Medvedev stated that the Russian government would change the way it works and begin administering exclusively on a project basis, something that usually occurs in business. He was addressing the plenary session of the Sochi 2016 International Investment Forum on September 30. Speaking at the plenary session the Russian Premier said, "Experience with project management in other countries bears witness to the fact that this system functions throughout the world." The prime minister said the government would focus on 11 priority targets, covering all economic and social spheres. Medvedev stressed that the project approach is oriented, first and foremost, towards improving efficiency and effectiveness. "Each budget ruble must improve the quality of services and goods, while each normative act that we sign must give a concrete result." The Council for Strategic Development, created earlier this year as an equivalent of the project office that existed at the end of the 20th century in the UK, will be tasked with the management of projects. The idea to create such an office was proposed at the 2015 St. Petersburg International Economic Forum by German Gref, president of Russia's largest retail bank, Sberbank, and former British Prime Minister Tony Blair. Medvedev highlighted three of the government’s 11 planned targets. One of these is the creation of a comfortable urban financial environment in Russia's largest cities. One way the government plans to develop the urban environment is by increasing the availability of mortgage credit. In 2015-2016, five million Russian families got mortgage credit, and the government hopes to double that number, Medvedev said. Mortgage credit is only useful however, if there are houses and apartments to buy. "In order for the number of mortgages to increase, we need to build more housing. We will be using the land that has been used ineffectively, especially the industrial areas in large cities," Medvedev said, adding that 50 million people, or a third of Russia’s population, live in large cities. Another way the government plans to improve the wellbeing of the population is to support small businesses and individual entrepreneurs. Currently, around one fourth of all Russian businessmen work in the small business segment, and the government hopes to increase this number significantly. "This indicator should grow to 40-50 percent of the economically active population,” Medvedev said. The government would like to see 445,000 new small companies open, particularly in underdeveloped sectors of the economy. In order to encourage growth in this segment, the government has created a network of leasing centres that can supply equipment at preferential rates. Approximately 20 billion rubles ($315.5 million) will be allocated in 2016 for these centres. The government is also committed to helping small enterprises find export markets. "The competitiveness of our goods under the brand ‘Made in Russia’ in all the world markets is the best response to all our geopolitical challenges," Medvedev said. The third project Medvedev mentioned in his speech was improving healthcare. According to Medvedev, among the steps the government will take towards the goal this year is allocating funds for the purchase of 1,800 ambulances. The prime minister said that support for priority work targets has already been included in the state budget. "Everything that is not directly related to these priorities must be thoroughly analyzed and, in certain cases, receive less financing,” Medvedev said, adding that projects that promise significant returns should take priority. The final list of concrete projects will be determined during the next session of the Council for Strategic Development, scheduled for early October. Before the forum began, an article by Medvedev outlining the government’s plans for Russia's social-economic development was published in the Rossiyskaya Gazeta newspaper. The main point of the text was that at the international level, economics have fallen victim to politics — a situation that complicates trade. "The ability to effectively transform political instability into economic growth is the government's duty. The economic agenda for the next five years will concentrate precisely on this matter," Medvedev said.